We've all been there. You get forced into one of those big events for school or work. They make you wear a name tag. You know the kind. The one that has a red border and the phrase "Hello, my name is..." printed on the front. Well, The Princess Bride Inigo Montoya sticker is for anyone who has lived through that moment, or anyone who's a true fan of the film. The sticker has "Hello, my name is Inigo Montoya" on the front. Of course, it also has "You killed my father. Prepare to DIE!" on it as well. It has an adhesive back and it sticks to clothing, backpacks, skateboards, or anywhere else that you might like to stick it. Just stick it on your shirt and start mingling! 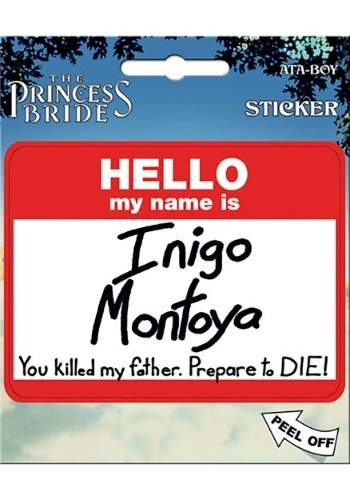 You'll quickly find out who the true Princess Bride fans are when they start quoting the great Inigo Montoya!